The most noticeable thing about the Nokia Lumia 800 is its elegance. It’s a beautiful piece of kit not because of what it adds in terms of design features, but for what it lacks. There are no faux-metal plastic backings, no superfluous edges, corners or protrusions, no unsightly ports sticking out at odd angles. It’s a matt black (or blue) device, with a unibody housing, and a slightly raised screen. The micro-USB port is hidden away, the speakers are subtly placed at the bottom, and there are few recesses to collect unsightly dust. It is the essence of minimal. At 142g, the Lumia 800 is also very light. Yet it feels reassuring in your hand, and doesn't have that 'plastic toy' feel you can get with some lighter phones. The weight combined with the rounded sides make it a comfortable hold, which is important when you're using your phone as much as I do. The one major flaw with its industrial design is the flap covering the micro-USB port used for charging and transferring data. Pushing on the plastic flap when its open, you can feel it about to snap. I can see this being the first casualty on the phone if you charge it and accidentally push it against a hard edge. 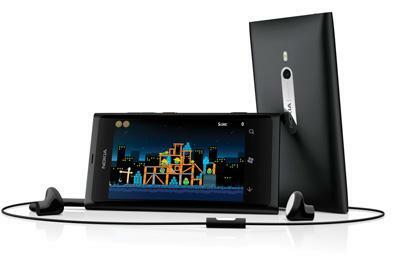 The Lumia 800 has a 3.7-inch Gorilla Glass touchscreen display, with a slight convex curve. The size of the screen is marginally better than an iPhone 4S, but at a resolution of 480 x 800 it's still difficult to read websites which aren't mobile optimised without a lot of pinch and zoom. The colours on the AMOLED display are bright and the blacks are crisp and not grayed out, which Nokia attributes to its ClearBlack screen filter technology. Some reviewers mention that it's hard to distinguish where the display panel ends and the bezel begins because there is no distinguishable edge. For me this had the effect of making the screen feel smaller than it actually was because my mind kept expecting it to fill right to the 'edge'. The screen display complements the Lumia 800's great camera. The 8 MP camera with Carl Zeiss optics takes great pictures in even low light situations, and shoots video at a maximum of 720p resolution. A nice touch and something which shows how serious Nokia is about cameras on its phones, is the two-stage camera button. A full push will bring the phone out of sleep into camera mode, a light push will set the focus, and a second full push takes the photo. Over a week of use, the average battery life I got out of the Lumia 800 was around seven hours of heavy mobile data use, which is good considering I usually only get six on my iPhone4S. Up to this point the Nokia Lumia 800 is almost identical to the Nokia N9, which was released in New Zealand last year. Where the N9 ran on the Meego operating system, the Lumia 800 uses Microsoft's Windows Phone 7.5 Mango (WP7) for its OS, and this is where I had the most difficulty with the phone. I freely admit that using WP7 was a complete culture shock, after years of using Android and iOS which both have very similar graphical user interfaces. These are both vertically-focused and you have tabs to move through different parts of an application. Most display elements have borders or visual cues like segments or tables. With WP7, your world gets turned sideways — literally. To move between important application elements and screens, you need to swipe horizontally. Text is usually free floating, and you can often find yourself with a lot of empty screen real estate. Moving to the minimalistic Metro UI of WP7 can be disorientating, and at times absolutely frustrating. The OS itself runs very smoothly on the 1.4 GHz Scorpion CPU. There is little to no lag swiping between screens, and I didn't suffer any force closes. The WP7 Internet Explorer web browser is pretty much the same experience as other smartphone browsers, but if you're looking to view Flash conent you're out of luck — WP7 doesn't support Flash at this time. Out of the box, the Lumia 800 comes with WP7 versions of Word, Excel, PowerPoint and Notes, and you can download other Microsoft enterprise software from the app Marketplace. The Office apps allow you to edit documents imported to the device, or stored on SkyDrive, Office 365, and SharePoint deployments in your business. The screen size of the Lumia 800 (and really most smartphones) doesn’t lend itself to editing large Word or Excel documents, but it's useful if you are on the go and just need to correct a spelling mistake before a meeting. Considering the powerful camera that the Lumia 800 packs, it was a shame that I couldn’t snap a photo and add it to the slide. Only the text could be edited. Nokia is pushing its free Nokia Drive application as a killer feature on the Lumia 800. The GPS navigation app has New Zealand and international maps, turn-by-turn, and voice directions. I found it to be very accurate, and while it doesn't have live traffic updates or some of the features you find in modern navigation units, it works well enough to get you from A to B.
I would recommend the Nokia Lumia 800 to most business buyers. It's a beautiful device, has an amazing camera, and some decent if underpowered integration with Microsoft enterprise software.